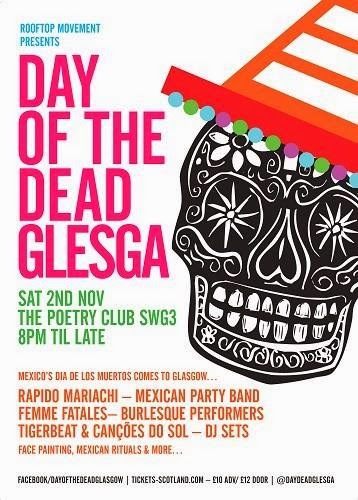 girl-e glasgow: Have a spooky weekend! Boo! Happy Halloween, people. Here are some activities to help you feel strange. Tonight at 6:30, comic shop and geek hangout, Geek Retreat, will be hosing a special Halloween party, featuring a scavenger hunt. Come before 6:30pm to ensure you get to participate in the game. Mono will be putting on a special menu all day Friday in honour of World Vegan Day. Come celebrate a far kinder, more environmentally friendly way to live by eating yummy Caribbean inspired meat and dairy free food. Going greener is delicious! November is National Novel Writing Month (NaNoWriMo) - when aspiring writers can make a pledge to write 50k words of a novel in one month. It's as hard as it sounds. I've done NaNoWriMo for several years now, and never finished the word goal. This year I will attempt it again. There is a great website with forums and pep talks from famous writers to help participants along. Glasgow beer week starts tomorrow. Beer related events will be held throughout the city by brewers, pubs and restaurants. Provanhall House, the oldest building in Glasgow and notoriously haunted, will be hosting a spooky lantern walk through the woods for families, followed by ghost stories at the house. Browse for graphic novels, back issues, games and DVDs at Glasgow's Comic and Toy Fair at Renfield St Stephen's Church. The fair will be running fro 11:00am to 4:00pm. Entry is free. 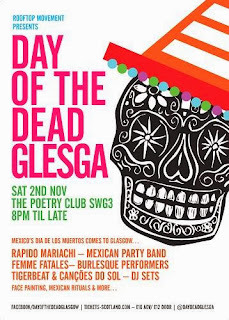 SWG3 will be hosting Day of the Dead Glesga - an evening of laying music, dancing, face painting and tequila to celebrate Mexico's Dia De Los Muertos. An exhibition at the People's Palace looks at the impact of Glasgow's most notorious housing scheme, the Red Road flats, which are due to be demolished soon. 1922 occult classic, Haxan, will be playing at the GFT at 8:00pm on Sunday. The film portrays satanic rituals, superstitions, and persecution of witches. The screening will feature live music.